The most awesome effects, the easiest way. Discover what you are able to do. Wizard Photo Editor is a new app for Android that allows to edit images, from photos already located in the device gallery or from pictures made within the app. After you finish editing, the resulting image can be saved in the device gallery (folder named "WizardPhotoEditor" will be created) and/or sent to any other applications (installed apps that support the "Share Image" option, eg Facebook, WhatsApp, ... ). We always work with a copy; the original photo will NEVER be modified or deleted from the device. 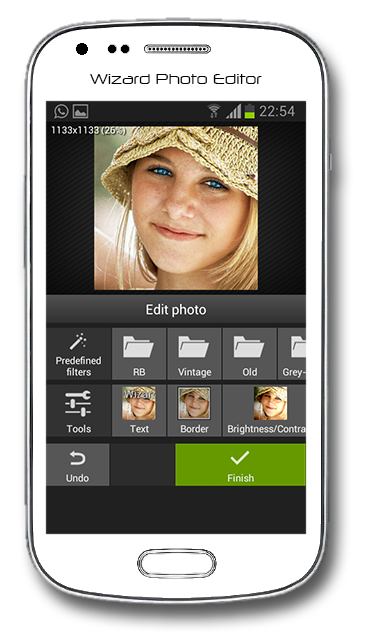 You can also start editing with Wizard Photo Editor from other applications that have the "Share Image" option. For example, from the Gallery of the device, any picture you are watching could be sent to Wizard Photo Editor to be edited with it. 1 - The picture enters the app, via any of the possible ways. 2 - Rotate if you want. 3 - Crop if desired (very useful if for example you want to make a "square profile picture" for a social app). 5 - EDIT. Apply all effects you want. You can choose from a gallery with "Predefined Filters" or use the "Tools" (Brightness, Contrast , Saturation, Text, Borders, ... ) to apply custom effects. 6 - When finished you can save the resulting image in your device's gallery and/or share it on any other apps. Wizard Photo Editor is and will always be a free application. The application displays ads as a way to support development and maintenance. There is also a buy option to remove ads.